Homeschooling our children stretches the organizational skills of the best of us. Planning a schedule, dealing with mountains of papers, focusing on what is most important--every day is a challenge. Get ideas and encouragement from a seasoned vet of nineteen years! On sale now for just $3.99, or get the entire Management for Moms series at a special price here. This is part of the Management for Moms series. This is a terrific series that every mom needs to have in her library. 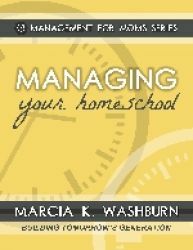 This is an awesome book to help you in keeping your homeschool running smoothly. Do you misplace things? Don’t know what to do with things? There is a whole chapter dealing with this! Then comes the Paper Monster chapter!! If you are like me, I keep almost every single thing that my kids do!! Then you have all the other paper things that come in the mail. She goes through each type of paper that you might possibly have and what you should do with it. The next section is a MIGHTY section for us homeschoolers!!! Keeping the HOME in Homeschooling: Dealing with Extra-Curriculars. Wow!!! Again, Wow!!! I know we want to give our children the very best and every advantage possible. But do you see yourself coming and going at the same time? She goes through and helps you see how to not spend all your time pushing here and there and outside of the home. Remember what is IMPORTANT!!! Another thing I love about this book is that she talks to the “Homeschool Vet.” When our last child is finished, does that mean that we are put out to pasture? What called us to homeschooling in the first place? She shows us how we can continue our calling but in a different way.